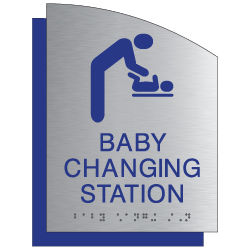 ADA Wall Sign for Restrooms with Baby Changing Stations - Designer Curved Brushed Aluminum Laminate Face with Acrylic Plastic Backer. Tactile Text and Grade 2 Braille. Our made-in-California ADA Brushed Aluminum and Matte Acrylic Signs are high-quality and professionally manufactured. Our curved brushed aluminum and matte acrylic ADA braille signs are an attractive alternative to standard blue plastic ADA signs and a great choice for modern offices, law firms, universities, and upscale retail stores.